The first season of “American Crime Story,” a new anthology series on the cable network FX, is titled “The People v. O.J. Simpson” and will begin a 10-week run on Tuesday, Feb. 2, at 10 p.m. The limited series takes the viewer inside the 1994-95 Simpson trial with a riveting look at the legal teams battling to convict or acquit the football legend of double homicide. Based on the book “The Run of His Life: The People v. O.J. Simpson” by Jeffrey Toobin, it explores the chaotic behind-the-scenes dealings and maneuvering on both sides of the court, and how a combination of prosecution overconfidence, defense shrewdness, and the LAPD’s history with the city’s African American community gave a jury what it needed: reasonable doubt. 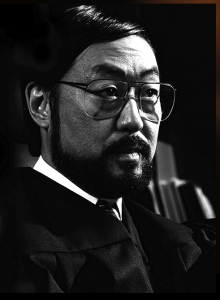 Kenneth Choi plays Los Angeles County Superior Court Judge Lance Ito, who presided over the trial and became a household name along with the various attorneys and witnesses. Choi most recently appeared on the small screen opposite Hope Davis in NBC’s series “Allegiance.” He was last seen in theaters starring alongside Leonardo DiCaprio and Jonah Hill in Martin Scorsese’s “Wolf of Wall Street.” In fall 2013, Choi starred on NBC’s “Ironside” alongside Blair Underwood. He also starred in Marvel’s “Captain America: The First Avenger” alongside Chris Evans and Red Dawn opposite Chris Hemsworth, Josh Hutcherson and Jeffrey Dean Morgan. “The People V. O.J. Simpson” features Cuba Gooding Jr. as Simpson; Sarah Paulson as prosecutor Marcia Clark; Sterling K. Brown as prosecutor Christopher Darden; Jordana Brewster as Denise Brown, victim Nicole Brown Simpson’s sister; Billy Magnussen as witness Kato Kaelin; Steven Pasquale as witness Mark Fuhrman; Connie Britton as Nicole Brown Simpson’s friend Faye Resnick; Malcolm Jamal-Warner as O.J. Simpson’s friend Al Cowlings; Paul Hansen Kim as witness Dr. Henry Lee; and Bruce Greenwood as District Attorney Gil Garcetti. Portraying Simpson’s defense team are John Travolta as Robert Shapiro; David Schwimmer as Robert Kardashian; Courtney B. Vance as Johnnie Cochran; Nathan Lane as F. Lee Bailey; Evan Handler as Alan Dershowitz; and Rob Morrow as Barry Scheck.